A Cessna Citation II, N550BP, was destroyed when it impacted Lake Michigan shortly after departure from Milwaukee-General Mitchell Airport, WI (MKE). The two pilots and four passengers were killed. The airplane was being operated by Marlin Air under the provisions of 14 CFR Part 135 and departed Milwaukee about 15:57 with an intended destination of Detroit-Willow Run Airport, MI (YIP). At the time of the accident flight, marginal visual meteorological conditions prevailed at the surface, and instrument meteorological conditions prevailed aloft; the flight operated on an instrument flight rules flight plan. The airplane was used to transport unspecified organs for transplant to a patient in Michigan. The pilot executed a climbing right turn to a northeast heading. The airplane's initial climb lasted for approximately one minute at which time the airplane levels off for approximately 16 seconds at a pressure altitude of 3,900 feet. The airplane then began another climb at about 1,300 feet per minute. This climb lasted for about 32 seconds at which time the airplane's pressure altitude was 4,400 feet. Radar data then showed the airplane in a descending left turn for the remaining 69 seconds of the data. The average descent rate during this period was 2,260 feet per minute. The airplane impacted the water of Lake Michigan approximately 243 knots indicated airspeed, 42 degrees nose down, and 115 degrees left wing down. During the climb the crew declared an emergency and their intention to return to Milwaukee. During those communications, one of the flight crewmembers reported that they had experienced a runaway trim. 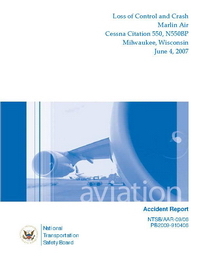 PROBABLE CAUSE: "The National Transportation Safety Board determines that the probable cause of this accident was the pilots’ mismanagement of an abnormal flight control situation through improper actions, including failing to control airspeed and to prioritize control of the airplane, and lack of crew coordination. Contributing to the accident were Marlin Air’s operational safety deficiencies, including the inadequate checkrides administered by Marlin Air’s chief pilot/check airman, and the Federal Aviation Administration’s failure to detect and correct those deficiencies, which placed a pilot who inadequately emphasized safety in the position of company chief pilot and designated check airman and placed an ill-prepared pilot in the first officer’s seat." Distance from Milwaukee-General Mitchell Airport, WI to Detroit-Willow Run Airport, MI as the crow flies is 363 km (227 miles).